Photo by davef3138 via CC BY-SA 2.0"
As summer turns to fall each year, serious deer hunters are hard at work preparing food plots in their hunting areas. In addition to helping entice deer to remain in these areas, food plots are also an important source of nutrition for deer herds during harsh winter weather when natural food sources may be buried under snow and ice or are otherwise unavailable. For most hunters, the traditional food plot has usually consisted of basic crops such as turnips, corn, and forage grains, like wheat, rye, and milo, along with higher protein plants, such as legumes, alfalfa and one or more varieties of clover. Many may have tried one of the newer, pre-mixed seed options formulated to promote antler growth or overall deer health with varying levels of success. While these choices offer a relatively inexpensive way to attract deer and provide them with needed nutrition, the downside is that many of the commonly used food crop options require frequent reseeding in order to produce enough food to attract deer and keep them coming back. Deer, like most every other creature, appreciate a little variety in their diet. 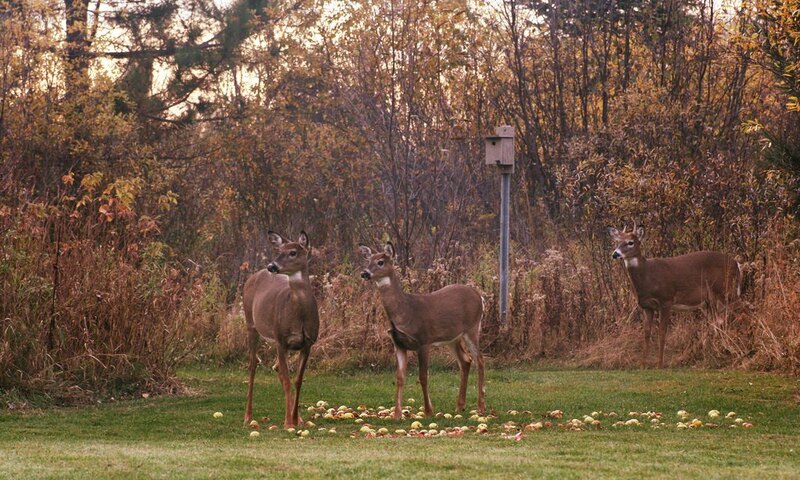 This is why adding fruit orchards to your deer feeding plan is an idea that deer hunters should be considering. Ripening fruit from trees, such as apples, pears, persimmons, and other varieties emit a sweet scent that deer love and will actively search to find. When offered a choice of standard grain crops or a windfall of ripe, sweet fruit, it is a sure bet that any deer in the area will be heading for the fruit trees. For the hunter, making the initial investment of purchasing and planting fruit trees is a smart choice. As long as the types selected are zoned correctly for the area and climate, most established fruit trees are able to produce on autopilot for years, with only some supplemental fertilizer for optimal growth. Unlike grain seed, established fruit trees can continue to grow and fruit, even in years when rainfall is above or below normal, with little assistance or nurturing from the hunter. Planting fruit trees for deer also makes a lot of sense when comparing the amount of available food they can provide in comparison to other crops. According to research conducted by the University of Minnesota, just one acre of mature, producing dwarf apple trees has the potential to produce between 16,000 and 20,000 pound of fruit. While the wilder conditions of a deer food plot will likely not offer this level of productivity, these numbers suggest that adding several fruit trees can be an excellent way to provide deer with a more abundant source of food. Deer, like many other species of wildlife, prepare for harsh winter weather and sparse food supplies by searching out and consuming foods with higher sugar and starch components in the fall. These include mast crops like acorns, as well as many varieties of fruit. Apples, persimmons, pears, and plums are excellent sources of the sugar and starch deer want and because this type of fruit will ripen and fall within reach of the deer in early fall, its availability is at just the right time to fulfill the deer’s instinctual needs. Like kids in a candy store, deer are drawn to the sweet scent of ripening fruit in their territory and will return frequently all fall long to clean up the fruit that has dropped since their last visit. Older bucks, the ones with the larger antler spreads, often stay in the immediate area of a secluded fruit tree to take advantage of natural cover and their favorite sources of calories, starch, and sugar. Since many fall hunting seasons coincide nicely with the time when the fruit ripens and falls, this creates an excellent opportunity for the hunter to see and bag a bigger buck. 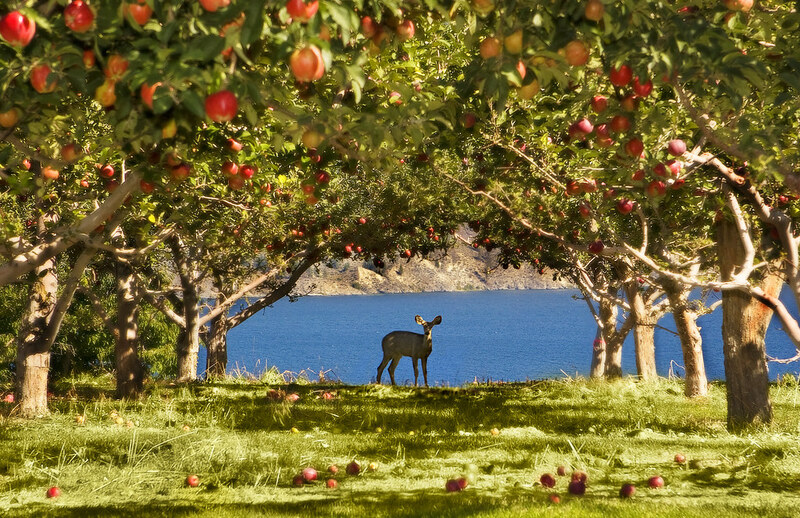 The first thing to know about planting fruit trees for deer is that deer are not concerned with the visuals. In other words, they do not care if the fruit is small, or oddly shaped, or even if it has some insect damage. All they want is tasty fruit and lots of it. For the hunter, this means searching for varieties of trees that will grow well in the climate and soil conditions where they will be planted, instead of searching for one that will offer prize winning formation or longer keeping qualities. A good plan for ongoing production of fruit can be to plant a mix of dwarf trees for earlier fruiting and full-sized trees for future production. Before planting, be sure to get a soil sample analysis, which will offer additional information that will be helpful in choosing trees that will be most likely to grow and thrive. Hunters who have decided to add fruit trees to their food plot plan should also be very careful in selecting the location for the trees. 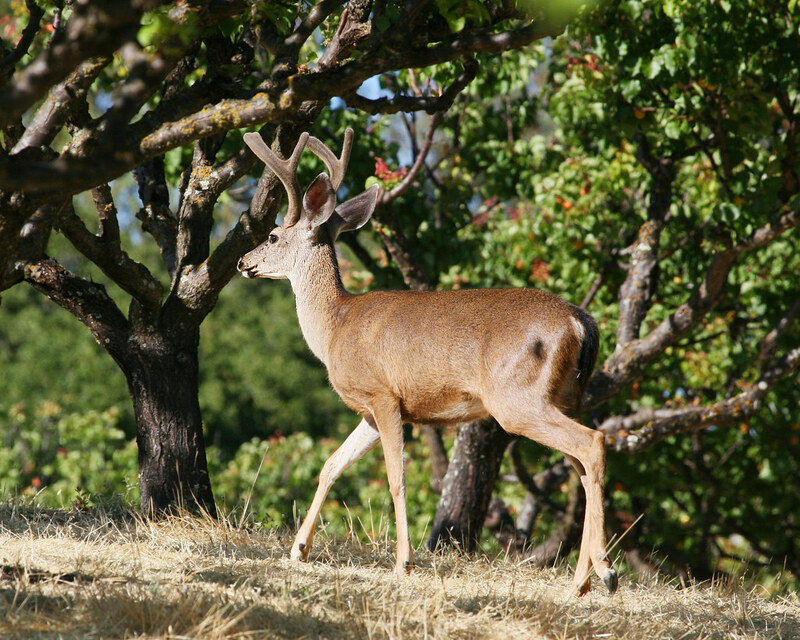 In addition to choosing an area where the soil components and drainage are optional for growth, it is important to remember that deer will be most attracted to fruit trees that offer at least some level of cover to make them feel secure. This can be tricky to do, especially when also trying to make sure that hunters also retain vantage points that will offer clear, unobstructed shots from both rifle and bow. A recent aerial still shot or drone footage of the area where the fruit trees will be located can be very helpful in choosing the best locations for planting. While apples are one of the most popular varieties of fruit trees to plant, hunters should consider adding other varieties, as well, to take advantage of a longer ripening season and increased opportunities for a successful hunt. Crabapples, persimmons, pears and plums are all good choices that ripen at different times. In addition, do some research to find out what varieties are already being grown successfully in your individual area, before making the final selection. Remember, too, that adding fruit trees does not have to be a once and done process. Instead, consider adding a few every year to promote long lasting growth and offer an opportunity to replace any that may have been damaged by weather or animals over the previous year. For help in choosing the best fruit trees for your area and deer management plans, consider speaking with local growers in your area. They can help ensure you choose the right tree variety, as well as offer good tips for planting and care.